WIBJJ.com and upwithwomen.org will be holding a special event to raise money for abused and homeless women this coming March. There has been a lot of excitement in the community about this event and every Brazilian Jiu Jitsu fan should mark March 12, 2016 on their calendar. This not only signifies a very important date in the week, Women’s International Day, but for the first time in Canadian history, at the Ajax Budokan Club in Ajax. 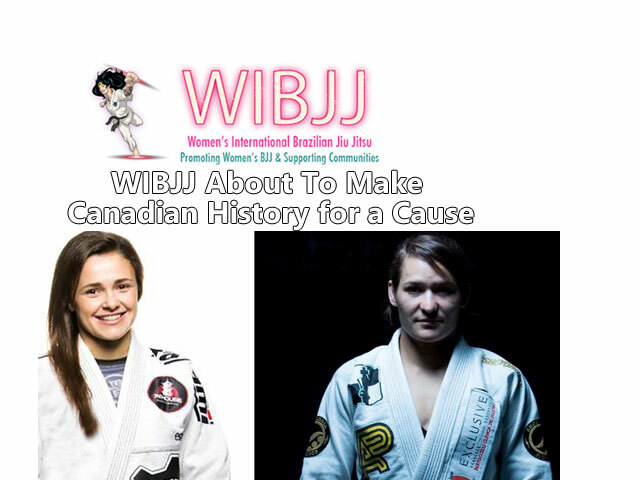 there will take place Canada’s first Women’s only Super Fights featuring, black belt Michelle Nicolini and Karen Antunes. The two will also be holding a seminar before the Super Fight! Both women are highly decorated athletes, holding multiple world championships and a wealth of experience in the sport. We can expect a brilliant seminar and a very exciting match between the two women. However, this event means much more than a seminar and competition, it’s a demonstration of how powerful a women can be. It’s hope for the community’s abused and homeless women. It sets an empowering example for abused women to stand up… It’s simply a great cause. The support has been outstanding. Many of the top BJJ Teams have representation in the Super Fights and many of the local community BJJ clubs have donated memberships to women in need! This means they will now have the opportunity in taking the life changing step of becoming part of a strong BJJ family. A Bjj family with strong women around them! The Seminar will begin at 9am Sharp! Doors will open at 8:30am and the seminar will end at 11:30am. Pictures take place between 11:30am and 12:00pm. Doors close at 12:15pm. Doors will reopen at 1:30pm and Super Fight demos will begin at 2pm sharp! You can visit WIBJJ.com to purchase tickets. You can also find all the pricing details and other information under the FAQ page.